The China Mapping Telescope was launched last week aboard Surrey Satellite Technology’s Beijing-1 spacecraft. The China Mapping Telescope – a powerful high-resolution instrument designed to map and photograph Chinese territory – was launched last week aboard Surrey Satellite Technology’s Beijing-1 spacecraft. Developed for the Beijing Landview Mapping Information Technology Company, the instrument will help China plan projects associated with the 2008 Beijing Olympics, as well as monitoring natural and manmade disasters. 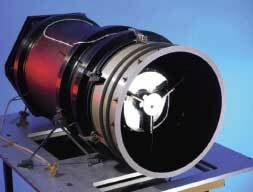 Based on a long-focus telescope also known as an Earth imager, the space-based camera/telescope built by SIRA weighs 25kg and uses just 12W of power. It can capture images of a 24km strip of ground from 700km above the Earth to a resolution of four metres. This means ground objects such as houses and vehicles can be distinguished from space. The technology presented significant engineering challenges during its design and build. David Purll, chief space scientist and project manager at SIRA, explained that owing to the combination of high-resolution and size limitation, it had to contain an almost perfect optical system. As a result, a light but extremely strong material — carbon fibre composite — was used for the telescope’s body. This was fixed to the satellite on flexible mounting legs. This offset any strain and resultant loss of optical quality through different rates of expansion between the telescope and satellite, which is constructed mainly of aluminium. Expansion was also limited by using low-expansion glass for the lenses. The telescope has two highly-polished mirrors with a series of lenses that correct aberrations. The 31cm primary mirror cannot be allowed to distort by more than 1/10 of the wavelength of light, and the alignment between the primary and secondary mirrors must stay within a few thousandths of a degree. This particular problem was overcome using a focus mechanism which moves one of the lenses to correct the focus once the moisture has gone.